I have read and agree to the HP Return Policy. 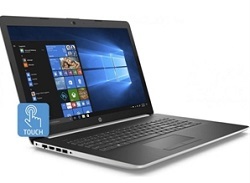 Designed for long-lasting performance, this HP 17" laptop offers the power to surf, stream and do so much more. Return / Exchange Policy: Any defective and/or support issues related to this product must be handled directly thru HP customer service during the given warranty period. At the discretion of HP, the manufacturer will repair or replace any defective systems (including DOA). Full refund product returns are not accepted by College Buys or HP. Sized to fit laptops with up to 17 inch displays with practical organization for everything else you need to carry. Get contemporary messenger styling with convenient top-load access for laptops with up to a 17" screen. Protect your Notebook PC with this subtly detailed, traditional sleeve. Photoshop has met its match. An all-in-one PDF creator that lets you assemble, edit and create PDFs.